May | 2012 | Can Men Cook? I’m not doing yet another review of The Lazy Toad just because we visited twice in one week. 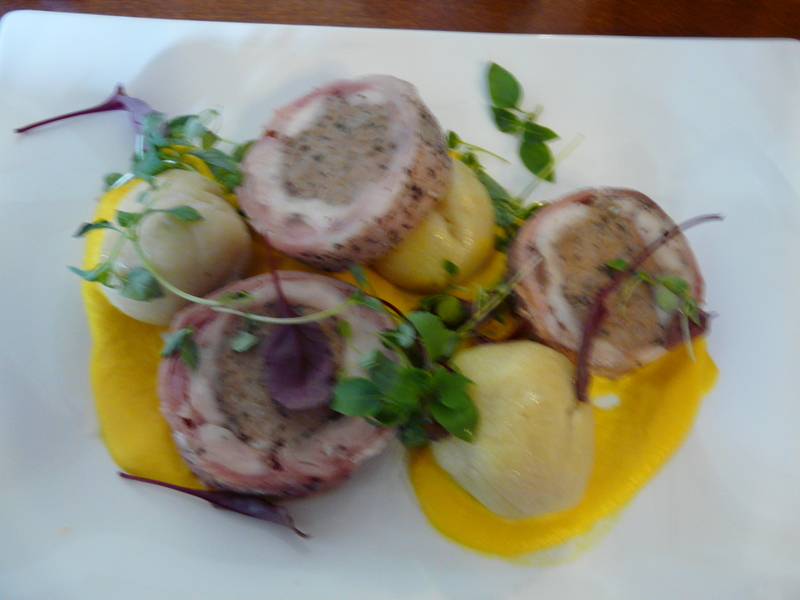 It is because it is an absolute gem of a dining pub and the food is quite sublime. I do not want to write about it too much, or indeed continue to praise its virtues to the highest for fear of not being able to get a reservation in the future. But as the Western Morning Press had named it Devon Dining Pub of the year, I guess the publicity monster is ahead of me, and I will have to fight for the right to eat there. It is well worth the effort. Bampford Speke is north of Exeter and is a smart little village with a splendid 3 ½ mile walk along the meandering Exe. That’s how we found this place – although our old pub walk book described the walk from The Agricultural Inn – which is what the Lazy Toad used to be in a previous life. Clive Walker is Front of House, along with Lisa. Mo, Clive’s wife, is Chef along with Ian and others. Visit One – just the two of us for Sunday Lunch. Yes, I know you can get roasts and carveries for £5.50, but the Toad doesn’t bother with that level of competition. It’s about £11 for their Roast Beef. Janie describes it as the best Sunday Roast she has ever eaten out. (Janie’s mum was a superb cook, and Pauline’s roast dinners had the extra touch that can only come from being done at home. There’s love in the mix too.) Now, having said that, you would have to say the whole team at the Toad invest significantly in the food and ambiance. They make sure you are welcomed – and introduce themselves and ask your name too (and remember it). And they patently love what they do – and it shows. A friend of mine who ran a dining pub in Marlow said that food that was fought over never tasted right. She didn’t allow chefs to get angry or above themselves. And I suppose what the Toad Team do is the opposite – nurturing and coaxing and sighing and enjoying. We shared a starter. Goats cheese soufflé with Waldorf Salad and leaves. There was a bit of a tussle to savour each scrumptious spoonful and make sure you got your fair share. And here’s the little extra touch. Because we said “can we just share a starter” – two extra plates and two sets of cutlery silently arrived unannounced and with absolute Rolls Royce efficiency so that you didn’t even notice it had happened until the food arrived and you had plates to share it onto. That’s why the place is so damn fine, and such a good experience. Those little things happen all the time. Look – things must go wrong occasionally. They do everywhere. But I bet it would be fixed faster and to everyone’s satisfaction in a better way here than in most places. We shared a Lemon Mousse encased in chocolate with a cherry water ice. Being greedy types we added a scoop of vanilla ice cream. We had to do a bit of a walk afterwards – taking the rest of the wine home. What a lovely lazy Sunday afternoon – dozing came easy. Saturday lunch was our chosen time. Chris went for the Steak and Kidney pudding. He was starting a cold, and this was comfort food at it’s most splendid. He couldn’t quite finish all of the rather meaningful pastry, which meant we could all have a try. You could probably work for 8 hours of dry stone walling after such a hunk of goodness. Paula and Janie both had Plaice Fillets in a creamy and lemon sauce. It was rather splendid again – with quite a bit of rich and fulsome sauce – a little bit like the old Sole Veronique? And then I went off piste. Pork faggots. I did say to Clive that I wouldn’t have ordered it anywhere else with as much confidence. My pushing of the envelope proved to be very successful. Wow. There was white pepper and thyme and lemon and, and, and – sorry, it just got too exciting. Look. The vegetables are great, the pudding choice outstanding, and the starters quite orgasmic. Just go. The Lazy Toad at Bampford Speke is very, very special. No, I’m not talking about those bags used to take away any excess food you ordered at the restaurant. Yes, we have all had that ‘eyes bigger than belly’ experience. Or indeed been surprised at the excessive portions the restaurant served. But I’m not going to discuss them in great detail. I am talking about those bags that are used by dog owners to pick up their pooh. Yep – those doggie bags. We have been on a walking holiday in Devon. A lot of the walks are from pubs and are circular in nature. This means you not only have somewhere to park the car, but also the huge incentive to get back in time for some lunch! And I have written about some of the more memorable ones and will return to some more of them too. The bad news is, I have been put off my lunch once or twice by seeing some of these bags on the walks. I know that 99.9% of dog owners are responsible and altogether pleasant coves. The imbecilic thoughtless and selfish gits who do half the job really do annoy me. One owner had thoughtfully hung the well-filled bag over the handle of a kissing gate! How awful is that? Who do they think is going to turn up and remove them? Why do they bother putting the crap in the bag at all? One county (Dorset, I think) has a poster campaign on popular walks that has the tag line “Flick it with your Stick”. Loads of walkers have walking poles nowadays – and they are really useful for walking uphill, pushing brambles out of the path, checking puddle depths – and flicking excrement out of a path and help to fertilize the undergrowth. Would the selfish bar stewards do this? No, I think not. You do see a lot of other waste matter on country walks of course, so as long as the dog has done it’s business in an area that doesn’t have the prospect of children rolling around, then flicking with a stick seems pretty OK to me. Hanging your doggie bag like a trophy for all to admire proves that some people don’t deserve to own a dog at all. And I hope I spy one doing it soon. I’d just love to run up to them with it and say, “Think you’ve forgotten something”. They’ve forgotten their brain and decency as well as their bag.